At age 11, Olivia’s involvement with Lyme awareness activities quickly escalated from doing the Lyme Challenge to starting a Facebook page called Olivia and Lyme to speaking to 300 medical professionals at the invitation of Lyme specialist and advocate Dr. Richard Horowitz. Olivia’s mother, Holiday Goodreau, says that she and her husband “have raised our kids to be very giving and get involved and do things for others,” including taking an active role in the family’s philanthropy to support early childhood learning and end homelessness in Colorado. While helping her mother set tables before a fundraising gala, Olivia said, “Mom, you do all this great stuff for other people, I want to do something for Lyme disease. It will be called the LivLyme Foundation, because my name is Liv and I’m living with Lyme.” That was in January 2017. When Olivia’s mother heard that Olivia had invited Dr. Horowitz to speak at her gala, “My jaw dropped, because we hadn’t talked about it or planned anything. So we got the foundation started and vowed to do it right, not just as a little side hobby. To decide which scientists she wanted to support, Olivia scoured the web and found the very best researchers who were on a path to make progress against Lyme disease. She chose Lyme specialists at three universities, including Ying Zhang, MD, PhD in the Bloomberg School’s Department of Molecular Microbiology and Immunology, who is pursuing new treatments, vaccines, and diagnostic tests for Lyme disease. In partnership with the Global Lyme Alliance, the LivLyme Foundation is supporting Dr. Zhang’s evaluation of the activity of essential oils and how they can enhance the power of antibiotics against Borrelia persisters and biofilms. Olivia’s research didn’t stop at her computer screen. 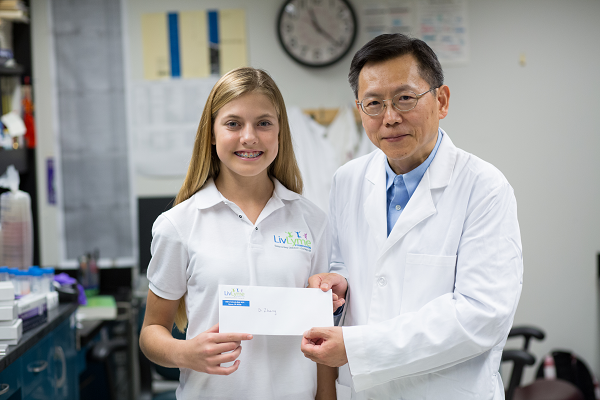 In November 2017, she visited Dr. Zhang’s lab at the Bloomberg School to witness the science of Lyme disease first hand. Olivia described Dr. Zhang as “super kind. We even Skyped!” He was a special guest at the April 2018 LivLyme Gala. When asked why she thinks people should give to support Lyme disease research, Olivia replied, “Everything helps! Your gift could mean that a child who has been suffering could feel much better.” We couldn’t have said it better.